I have published 54 journal articles, and a range of book chapters, and opinion or editorial pieces. Find a full list of my journal and book publications here. The permeability of random heterogeneous materials, with specific applications to volcanic and other crustal rocks. The coalescence of large heterogeneous arrays of viscous liquid droplets under surface tension, applied pressures, and chemical disequilibrium conditions. The viscoelastic response of multiphase magmas to stress, including cycles of material rupture and healing. I additionally have contributed to work involving bubble growth and bubble deformation during flow of magmas, the formation of obsidian, the motives and methods of producing vitrified forts in European antiquity, and the evolution of language use in modern poets, among other topics. Bubble growth and resorption in magma: A quantitative study. Diamond Light Source synchrotron beamtime grant at i12. Awarded in 2017. Co-investigator (PI: Ed Llewellin). Testing the Wedgwood pyrometer of 1786. Studi_Forscht@GEO grant W18_F16. Awarded in 2017. Principal investigator. Hysteresis processes in large volcanic eruptions: the evolution from pumice to obsidian. Swiss Light Source synchrotron beamtime grant at TOMCAT x02DA. Awarded in 2016. Co-investigator (PI: Mathieu Colombier). In situ viscous sintering of volcanic ash. Swiss Light Source synchrotron beamtime grant at TOMCAT x02DA. Awarded in 2014. Principal investigator. The valves of a volcano. Deutscher Akademischer Austauchdienst (DAAD) grant to host a research internship. Awarded in 2012. Principal investigator. Co-founder (with Dr Jamie Farquharson) of the first diamond open-access volcanology journal: Volcanica. We welcome submissions of your research across any aspect of volcanology. Organiser of, and poet at Republic of Verse, an international poetry project providing poetry to anyone, anywhere, for free. Ana Casas. High temperature gas-ash interactions at volcanoes. DAAD-Conacyt scholarship. Co-supervisors: Corrado Cimarelli, Donald Dingwell. 2015-ongoing. Tegen Havard. Sintering multiphase magmas. Co-supervisor: Kate Dobson. 2018-2019. Janina Adolf. The wettability of molten volcanic ash on carbon-based substrates. Co-supervisor: Wenjia Song. 2017-2018. Caron Vossen. The sound of failure: Using acoustic emission signals to predict the rupture of viscoelastic silicate liquids. Co-supervisor: Jeremie Vasseur. 2017-2018. Taylor Witcher. How slow can you flow? 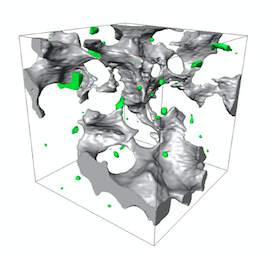 The viscous-to-brittle transition in silicate liquids. Co-supervisor: Bettina Scheu. 2016-2017. Jenny Schauroth. Sintering of natural volcanic ash at magmatic conditions. Co-supervisor: Bettina Scheu. 2015-2016. Lamur, A., Kendrick, J.E., Wadsworth, F.B. & Lavallée, Y. (2019). Fracture healing and strength recovery in magmatic liquids. Geology 47(3): 195-198. Wadsworth, Fabian B., Witcher, Taylor, Vossen, Caron E. J., Hess, Kai-Uwe, Unwin, Holly E., Scheu, Bettina, Castro, Jonathan M. & Dingwell, Donald B. (2018). Combined effusive-explosive silicic volcanism straddles the multiphase viscous-to-brittle transition. Nature Communications 9(1): 4696. Lamur, Anthony, Lavallée, Yan, Iddon, Fiona E., Hornby, Adrian J., Kendrick, Jackie E., von Aulock, Felix W. & Wadsworth, Fabian B. (2018). Disclosing the temperature of columnar jointing in lavas. Nature Communications 9(1): 1432. Farquharson, Jamie I. & Wadsworth, Fabian B. (2018). Upscaling permeability in anisotropic volcanic systems. Journal of Volcanology and Geothermal Research 364: 35-47. Schmid, Diana, Scheu, Bettina, Wadsworth, Fabian B., Kennedy, Ben M., Jolly, Arthur & Dingwell, Donald B. (2017). A viscous-to-brittle transition in eruptions through clay suspensions. Geophysical Research Letters 44(10): 4806-4813. Mueller, Sebastian B., Ayris, Paul M., Wadsworth, Fabian B., Kueppers, Ulrich, Casas, Ana S., Delmelle, Pierre, Taddeucci, Jacopo, Jacob, Michael & Dingwell, Donald B. (2017). Ash aggregation enhanced by deposition and redistribution of salt on the surface of volcanic ash in eruption plumes. Scientific Reports 7: 45762. Vasseur, Jérémie, Wadsworth, Fabian B., Heap, Michael J., Main, Ian G., Lavallée, Yan & Dingwell, Donald B. (2017). Does an inter-flaw length control the accuracy of rupture forecasting in geological materials? Earth and Planetary Science Letters 475: 181-189. Wadsworth, Fabian B., Vasseur, Jérémie & Damby, David E. (2017). Evolution of Vocabulary in the Poetry of Sylvia Plath. Digital Scholarship in the Humanities 32(3): 660-671. Heap, Michael J., Violay, Marie, Wadsworth, Fabian B. & Vasseur, Jérémie (2017). From rock to magma and back again: The evolution of temperature and deformation mechanism in conduit margin zones. Earth and Planetary Science Letters 463: 92-100. Wadsworth, Fabian B., Heap, Michael J., Damby, David E., Hess, Kai-Uwe, Najorka, Jens, Vasseur, Jérémie, Fahrner, Dominik & Dingwell, Donald B. (2017). Local geology controlled the feasibility of vitrifying Iron Age buildings. Scientific Reports 7: 40028. Heap, Michael J., Kushnir, Alexandra R. L., Gilg, H. Albert, Wadsworth, Fabian B., Reuschlé, Thierry & Baud, Patrick (2017). Microstructural and petrophysical properties of the Permo-Triassic sandstones (Buntsandstein) from the Soultz-sous-Forêts geothermal site (France). Geothermal Energy 5(1): 26.
von Aulock, Felix W., Kennedy, Ben M., Maksimenko, Anton, Wadsworth, Fabian B. & Lavallée, Yan (2017). Outgassing from Open and Closed Magma Foams. Frontiers in Earth Science 5: 46. Kushnir, A. R. L., Martel, C., Champallier, R. & Wadsworth, F. B. (2017). Permeability Evolution in Variably Glassy Basaltic Andesites Measured Under Magmatic Conditions. Geophysical Research Letters 44(20): 10,262-10,271. Vasseur, Jérémie & Wadsworth, Fabian B. (2017). Sphere models for pore geometry and fluid permeability in heterogeneous magmas. Bulletin of Volcanology 79(11): 77. Mueller, Sebastian B., Kueppers, Ulrich, Ametsbichler, Jonathan, Cimarelli, Corrado, Merrison, Jonathan P., Poret, Matthieu, Wadsworth, Fabian B. & Dingwell, Donald B. (2017). Stability of volcanic ash aggregates and break-up processes. Scientific Reports 7(1): 7440. Colombier, Mathieu, Wadsworth, Fabian B., Gurioli, Lucia, Scheu, Bettina, Kueppers, Ulrich, Di Muro, Andrea & Dingwell, Donald B. (2017). The evolution of pore connectivity in volcanic rocks. Earth and Planetary Science Letters 462: 99-109. Farquharson, Jamie I., Wadsworth, Fabian B., Heap, Michael J. & Baud, Patrick (2017). Time-dependent permeability evolution in compacting volcanic fracture systems and implications for gas overpressure. Journal of Volcanology and Geothermal Research 339: 81-97. Song, Wenjia, Lavallée, Yan, Wadsworth, Fabian B., Hess, Kai-Uwe & Dingwell, Donald B. (2017). Wetting and Spreading of Molten Volcanic Ash in Jet Engines. The Journal of Physical Chemistry Letters 8(8): 1878-1884. Kendrick, Jackie E., Lavallée, Yan, Varley, Nick R., Wadsworth, Fabian B., Lamb, Oliver D. & Vasseur, Jérémie (2016). Blowing Off Steam: Tuffisite Formation As a Regulator for Lava Dome Eruptions. Frontiers in Earth Science 4: 41. Heap, Michael J. & Wadsworth, Fabian B. (2016). Closing an open system: Pore pressure changes in permeable edifice rock at high strain rates. Journal of Volcanology and Geothermal Research 315: 40-50. Schauroth, Jenny, Wadsworth, Fabian B., Kennedy, Ben, von Aulock, Felix W., Lavallée, Yan, Damby, David E., Vasseur, Jérémie, Scheu, Bettina & Dingwell, Donald B. (2016). Conduit margin heating and deformation during the AD 1886 basaltic Plinian eruption at Tarawera volcano, New Zealand. Bulletin of Volcanology 78(2): 12. Vasseur, Jérémie, Wadsworth, Fabian B., Lavallée, Yan & Dingwell, Donald B. (2016). Dynamic elastic moduli during isotropic densification of initially granular media. Geophysical Journal International 204(3): 1721-1728. Wadsworth, Fabian B., Heap, Michael J. & Dingwell, Donald B. (2016). Friendly fire: Engineering a fort wall in the Iron Age. Journal of Archaeological Science 67: 7-13. Kennedy, Ben M., Wadsworth, Fabian B., Vasseur, Jérémie, Ian Schipper, C., Mark Jellinek, A., von Aulock, Felix W., Hess, Kai-Uwe, Kelly Russell, J., Lavallée, Yan, Nichols, Alexander R.L. & Dingwell, Donald B. (2016). Surface tension driven processes densify and retain permeability in magma and lava. Earth and Planetary Science Letters 433: 116-124. Heap, Michael J., Wadsworth, Fabian B., Xu, Tao, Chen, Chong-feng & Tang, Chun’an (2016). The strength of heterogeneous volcanic rocks: A 2D approximation. Journal of Volcanology and Geothermal Research 319: 1-11. Wadsworth, Fabian B., Vasseur, Jérémie, Scheu, Bettina, Kendrick, Jackie E., Lavallée, Yan & Dingwell, Donald B. (2016). Universal scaling of fluid permeability during volcanic welding and sediment diagenesis. Geology 44(3): 219-222. Ayris, Paul M., Cimarelli, Corrado, Delmelle, Pierre, Wadsworth, Fabian B., Vasseur, Jeremie, Suzuki, Yujiro J. & Dingwell, Donald B. (2015). A novel apparatus for the simulation of eruptive gas-rock interactions. Bulletin of Volcanology 77(12): 104. Schipper, C. Ian, Castro, Jonathan M., Tuffen, Hugh, Wadsworth, Fabian B., Chappell, Debra, Pantoja, Andres E., Simpson, Mark P. & Le Ru, Eric C. (2015). Cristobalite in the 2011–2012 Cordón Caulle eruption (Chile). Bulletin of Volcanology 77(5): 34. Lavallee, Yan, Wadsworth, Fabian B., Vasseur, Jeremie, Russell, James K., Andrews, Graham D. M., Hess, Kai-Uwe, von Aulock, Felix W., Kendrick, Jackie E., Tuffen, Hugh, Biggin, Andrew J. & Dingwell, Donald B. (2015). Eruption and emplacement timescales of ignimbrite super-eruptions from thermo-kinetics of glass shards. Frontiers in Earth Science 3: 2. Wadsworth, Fabian B., Kennedy, Ben M., Branney, Michael J., von Aulock, Felix W., Lavallée, Yan & Menendez, Amaya (2015). Exhumed conduit records magma ascent and drain-back during a Strombolian eruption at Tongariro volcano, New Zealand. Bulletin of Volcanology 77(9): 71. Vasseur, Jérémie, Wadsworth, Fabian B., Lavallée, Yan, Bell, Andrew F., Main, Ian G. & Dingwell, Donald B. (2015). Heterogeneity: The key to failure forecasting. Scientific Reports 5(1): 13259. Ashwell, Paul A., Kendrick, Jackie E., Lavallée, Yan, Kennedy, Ben M., Hess, Kai-Uwe, von Aulock, Felix W., Wadsworth, Fabian B., Vasseur, Jeremie & Dingwell, Donald B. (2015). Permeability of compacting porous lavas. Journal of Geophysical Research: Solid Earth 120(3): 1605-1622. Hornby, Adrian J., Kendrick, Jackie E., Lamb, Oliver D., Hirose, Takehiro, De Angelis, Silvio, von Aulock, Felix W., Umakoshi, Kodo, Miwa, Takahiro, Henton De Angelis, Sarah, Wadsworth, Fabian B., Hess, Kai-Uwe, Dingwell, Donald B. & Lavallée, Yan (2015). Spine growth and seismogenic faulting at Mt. Unzen, Japan. Journal of Geophysical Research: Solid Earth 120(6): 4034-4054. Wadsworth, Fabian B., Damby, David E., Hearne, Rebecca L., Le Blond, Jennifer S., Vasseur, Jérémie, Najorka, Jens, Hess, Kai-Uwe & Dingwell, Donald B. (2015). The feasibility of vitrifying a sandstone enclosure in the British Iron Age. Journal of Archaeological Science: Reports 4: 605-612. Lavallée, Yan, Dingwell, Donald B., Johnson, Jeffrey B., Cimarelli, Corrado, Hornby, Adrian J., Kendrick, Jackie E., von Aulock, Felix W., Kennedy, Ben M., Andrews, Benjamin J., Wadsworth, Fabian B., Rhodes, Emma & Chigna, Gustavo (2015). Thermal vesiculation during volcanic eruptions. Nature 528(7583): 544-547. Heap, Michael J., Farquharson, Jamie I., Wadsworth, Fabian B., Kolzenburg, Stephan & Russell, James K. (2015). Timescales for permeability reduction and strength recovery in densifying magma. Earth and Planetary Science Letters 429: 223-233. Song, Wenjia, Hess, Kai-Uwe, Damby, David E., Wadsworth, Fabian B., Lavallée, Yan, Cimarelli, Corrado & Dingwell, Donald B. (2014). Fusion characteristics of volcanic ash relevant to aviation hazards. Geophysical Research Letters 41(7): 2326-2333. Wadsworth, Fabian B., Vasseur, Jérémie, von Aulock, Felix W., Hess, Kai-Uwe, Scheu, Bettina, Lavallée, Yan & Dingwell, Donald B. (2014). Nonisothermal viscous sintering of volcanic ash. Journal of Geophysical Research: Solid Earth 119(12): 8792-8804. Kueppers, Ulrich, Cimarelli, Corrado, Hess, Kai-Uwe, Taddeucci, Jacopo, Wadsworth, Fabian B. & Dingwell, Donald B (2014). The thermal stability of Eyjafjallajökull ash versus turbine ingestion test sands. Journal of Applied Volcanology 3(1): 4. Vasseur, Jérémie, Wadsworth, Fabian B., Lavallée, Yan, Hess, Kai-Uwe & Dingwell, Donald B. (2013). Volcanic sintering: Timescales of viscous densification and strength recovery. Geophysical Research Letters 40(21): 5658-5664.